Juggling a family schedule can be hectic, especially when doctor’s appointments are involved. Cosmetic and general dentist Lynn Griebahn, DDS, at Main Family Dental Care in Davenport, Iowa, knows that family dental health is essential. That’s why Dr. Griebahn serves men, women, and children of all ages and levels of oral care needs. Main Family Dental Care, “Home of the Friendly Dentist”, can provide dental services for your entire family. Call or book an appointment online today. What can a family dentist do for you and your family? At Main Family Dental Care, Dr. Griebahn and the staff care about your family’s individual needs. Didn’t think hassle-free dental care was possible? Try Main Family Dental Care and experience the difference. Even if your family has both young children and adults, Dr. Griebahn can take care of everyone’s dental health concerns. Training in a wide variety of oral care needs makes Dr. Griebahn an excellent family dentist for all stages of life. Why is it important for kids to see a dentist? The sooner your children start seeing a dentist, the healthier their mouths will be throughout their lives. The American Dental Association and the American Academy of Pediatrics recommend your child get a dental checkup by age 1, or once their first tooth comes in. Dr. Griebahn knows that exceptional oral health starts early. Main Family Dental Care understands that your kids need to feel safe and comfortable at the dentist. A friendly atmosphere is essential! The toys and TVs in Main Family Dental Care’s waiting room will keep your child entertained before their appointment. Dr. Griebahn’s warm chairside manner will take away the anxiety your child might have about going to the dentist and help encourage great dental health habits for years to come. Why should your child see an orthodontist? Your teeth and bite are continually undergoing minor changes. Sometimes they need to be adjusted or straightened, and that’s where an orthodontist can help. To optimize your child’s dental health, it’s crucial to take care of their orthodontic needs during childhood or adolescent years. If you wait too long, optimal results may not be possible because your child’s face and jaws have finished growing. Dr. Griebahn provides orthodontic services, too, so you can check that off your list of concerns. Main Family Dental Care has it covered. Dr. Griebahn offers office hours into the early evening for added convenience, so your child doesn’t need to miss school for dental or orthodontic appointments. 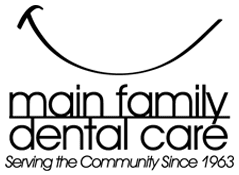 If you’re searching for a qualified general dentist who can take care of your whole family, schedule an appointment online or call Main Family Dental Care today.